Hidden Signals Challenge: can you help identify biothreats in real time? We're excited to be supporting the first stages of a new challenge that seeks to use data to detect emerging biothreats earlier. To help kick off this challenge, we're pleased to share a guest post from our good friends over at Luminary Labs. 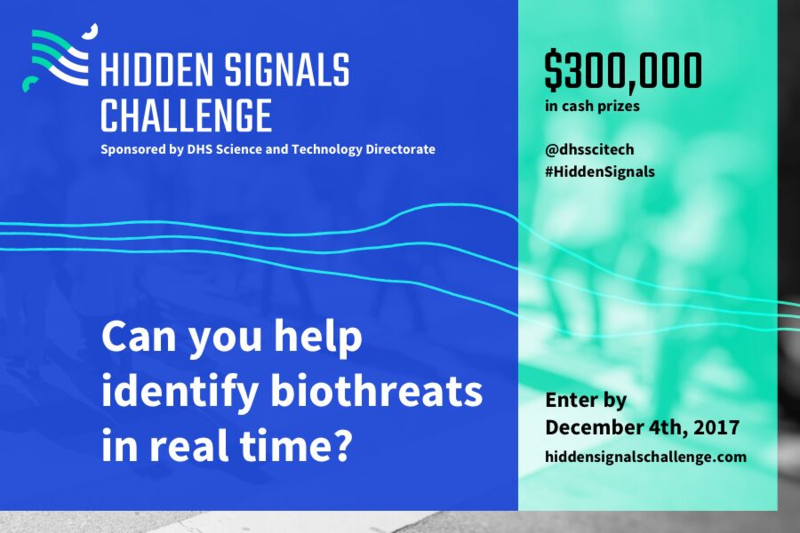 This month the US Department of Homeland Security (DHS) Science and Technology Directorate (S&T), in collaboration with the Office of Health Affairs National Biosurveillance Integration Center (NBIC), launched the $300,000 Hidden Signals Challenge. The Challenge calls upon data innovators to develop concepts for novel uses of existing data that will identify signals and achieve timelier alerts for biothreats in our cities and communities. Interested in entering? Those interested in participating in the Challenge should submit their concept by 4:59 PM ET, Monday, December 4, 2017. The judges will evaluate the submissions and select up to five Finalists to advance to Stage 2. Stage 1 Finalists will receive $20,000 in seed money to further develop concepts into detailed system designs in Stage 2. To learn more, join their informational webinar on November 1, 2017 at 2:00 PM ET. During the webinar, organizers will give an in-depth overview of the Challenge, cover Stage 1 & Stage 2, and conduct a live Q&A. RSVP today! Look for updates about the Challenge on S&T’s Twitter, Facebook, and LinkedIn pages using #HiddenSignals. We hope you'll check out the challenge and submit your ideas to help keep these communities healthy and safe. The open innovation practice at Luminary Labs designs and produces large-scale prize competitions for both the public and private sector, using a multi-stage challenge approach that shepherds the strongest solutions through an iterative process of refinement.